It’s almost that most wonderful time of the year for shoppers in Paris. This year, “Les Soldes d’Eté” launch on Wednesday June 25. 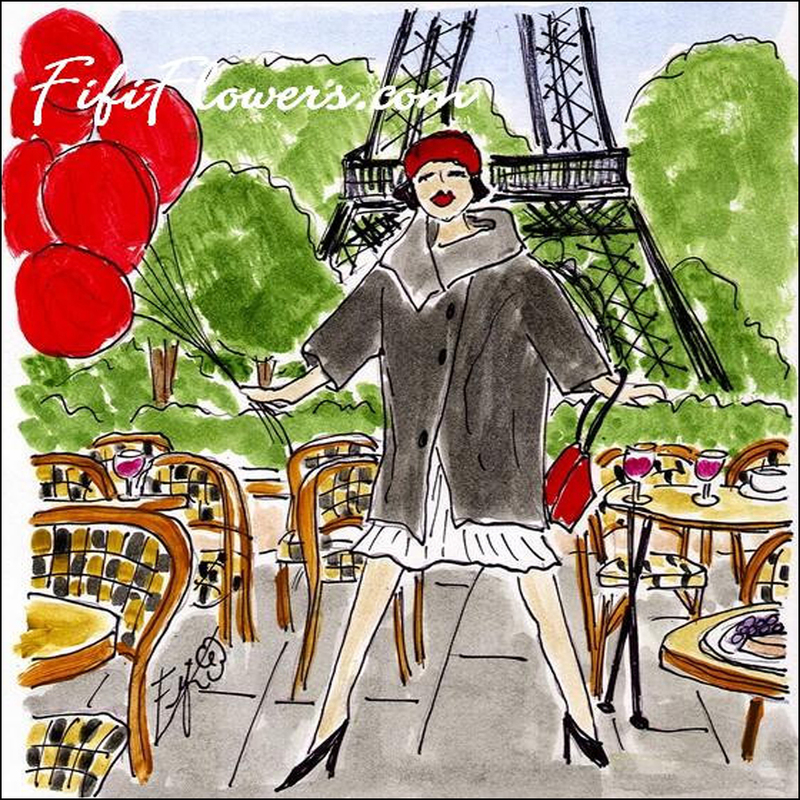 So in celebration, I’m not only updating my big summer sales tip sheet, but I’m also shining a bright spotlight on one of my favorite artists, Fifi Flowers. Inspired by artists like Henri Matisse and Henri de Toulouse-Lautrec, Fifi paints the City of Light in bright hues, bold strokes, and intricate curlicues. Possessing retro whimsy, her signature brand of wit and charm captures Paris’s shapely Art Nouveau street furniture, sleek black iron balustrades and manicured flowerbeds, along with cocktails, poodles, and scooter bikes—all girly, glamorous, and gussied-up to the nines in nifty, fifty shades of pink. As Coco Chanel once said, “Fashion is in the sky, in the street, fashion has to do with ideas, the way we live, what is happening!” Mais oui! Sigh. Now who hasn’t dreamed about being THERE before? Dig her work? Then pop by her online shop. Original art and stationary are available. Through September 30, Fifi is generously offering us a 25 per cent discount. “Paris25” is the magic code! 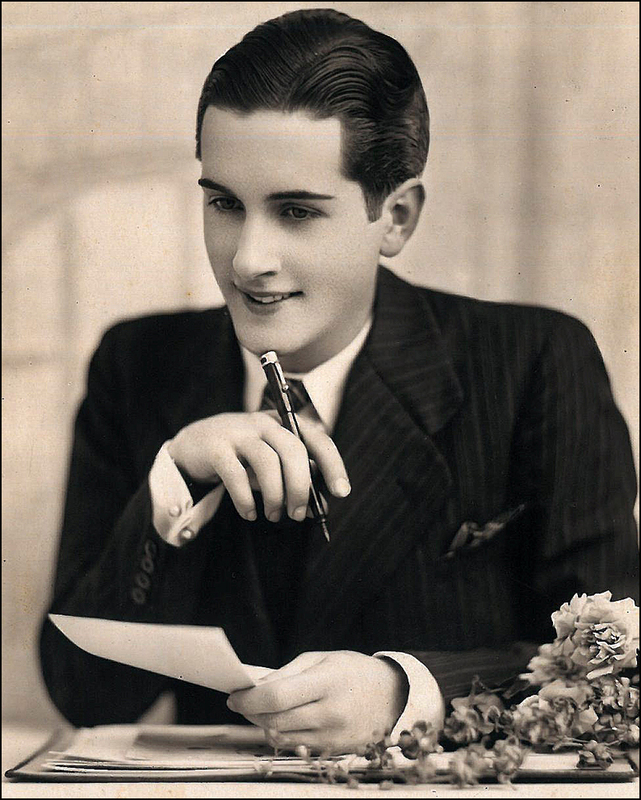 In the world of texts and emoticons, a little handwriting will feel good to the hand, spirit, or paramour! Now, let’s get down to popping some discount tags. And get the printers cranking! I highly recommend having a “quest” in mind, since visualization will help narrow your hunt while increasing your chances of finding the object of your desire. What’s missing from your closet? A trench coat? Ballet slippers? Both are timeless French classics, and quite souvenir-worthy. Covet nautical wear? Who hasn’t been struck by the bold stripes of the traditional nautical shirts of Brittany? This look not only touched appealingly rugged-types like Picasso, Hemingway, and Gaultier, but also lured Jean Seberg, Brigitte Bardot, and Audrey Hepburn. Described by Hemingway as “very stiff and built for hard wear but softened by washings,” you’ll find beaucoup de Breton stripes throughout Paris. Consider your basic shopping tool kit: water bottle, pre-cut moleskin, chocolate (for energy), gum, eye drops, Métro tickets, maps with targeted shops circled, and a few coins for WCs. And don’t forget an oversized bag for your treasures. Most French grocery store chains sell them for just a few cents. Lightweight and good-looking, they make perfect souvenirs, too. After your arrival, while waiting for a taxi or before jumping on the RER train, pick up a few fashion magazines at Les boutiques Aéroports de Paris. You can’t miss their bright red signs. Getting you coming and going, there’s usually one located just outside of baggage. Here’s a great way to find out what’s happening on the streets of Paris before actually hitting the cobblestones. Often magazines like Be, Elle, Marie Claire, and Vogue include a free gift with purchase. I recently scored a scarf and cosmetics, along with a chic Édition Limitée Nuisette (nightie) by Princesse Tam Tam in a drop-dead burgundy. Talk about a win-sin. I spy. If time permits, visit your favorite shops just before the sale. Memorize the layout. Take note of “rack formations.” Also, try on clothing—you’ll avoid the lines later. When should you pounce? In France, “smalls” fly out the door first, but “large” and “X-large” stick around a little longer. On the other hand, prices drop as the sales progress, so it’s a gamble. Know your European size numbers. Tip for the road: Avoid the masses by shopping weekday mornings or early afternoons. My friend Véronique beats the crowds by scooting around by bike. “I’m able to visit at least twenty shops by 10 AM,” she boasts, while installing her new jumbo-sized basket just in time for the sale. Need a bike? Rent a ‘Vélib’! I also recommend kicking off your hunt for garb around Paris’s centuries-old shopping districts like Place Vendôme, Avenue Montaigne, and Rue du Faubourg St-Honoré. Perfect for window-shopping, take note of what’s hot in the high-ticket vitrines, and then commit the designs to memory. Rest assured, you’ll be able to find similar styles in the more affordable “indy” boutiques and trendy chains. However, if you’ve got the cash to splash, make it rain! If the shoe fits, dear Cendrillon, then I say wear it! Just hold on to your umbrella and necklace while making your entrance at Dior, all you Carrie Bradshaw wannabes. Who says money can’t buy you love? Befriend the staff. Throughout the year, my friend Dominique drops off chocolates for the sales team at her favorite shops. Guess who hears about the bargains first? Don’t live in Paris full-time? Send thank-you notes after each visit. For the love of sanity, don’t buy your Métro tickets (good for both the bus and Metro) one or two at a time. Purchase a “carnet” (10-pack). With a thick stack of tickets in your hot little hand, you’ll not only save about €3 over the single-ticket price, but you’ll also be able to focus on more pressing matters, like shopping, museums, and most importantly, food! Tip for the road: When grand touring, time is precious. However, it is possible to visit two fashion-related exhibitions, three historical monuments, four department stores, and five prime (and affordable) shopping districts—all on one day. It’s true! My eyes have seen the glory. What’s my secret? Get on the bus, Gus! Paris’s great mass transit system (a.k.a. the RATP) helps me feed my passion for bargain fashion, especially during big annual winter and summer sales. For the mere price of a Métro ticket, you’ll not only cruise between the shopping havens with the greatest of ease, but also brag about your first scores of the day while the panorama of Paris rolls by en route to the next shopping district. There are several shopping meccas long the “95” bus route, to cite just one example: rue de Rennes, rue de Rivoli, Carrousel du Louvre, Montmartre-Abbesses, the grand magasins along Boulevard Haussmann, and the neighborhood surrounding the Opéra. Dear Black Swans, the historic Répetto ballet shop is just a hop, skip and a pirouette from the old Opéra Garnier (of Phantom fame). Sometimes it is possible to have your historical cake and take-away bling, too. Vintage shops often reduce prices, too. You’ll find pockets of boutiques scattered through Montmartre (start at La Caverne à Fripes at 25, rue Houdon) and the Marais, where at Vintage Désir (32 rue des Rosiers) you’ll find a vast collection of striped shirts. Also, don’t miss Paris’s 19th century shopping arcades (a.k.a. “dream houses”). Flooded with natural light, their narrow tiled halls are smartly dressed in glazed roofing, cast iron, mosaics, and marble pillar columns, along with sculptures and frescoes, giving a whiff of old-fashioned Parisian glamour. Hives of activity, here you’ll find art galleries, bookshops, antique stores, shoe cobblers, boutiques, cafés, and bars. Discount shops like Sympa in Montmartre and TATI on Boulevard Rochechouart take their already bargain basement prices to new lows. Sympa’s bargain bin shops (which were once dance halls and brothels that Pablo Picasso frequented during his “blue period”) are also where the famed terpsichorean, La Goulue (“The Glutton”), made her debut. Now you can nab your own knickers in the very room where she once flashed her heart-embroidered bloomers so fetchingly at the absinthe quaffing crowds. “When I see my behind in these paintings, I find it quite beautiful!” La Goulue told Toulouse-Lautrec when she saw his drawings of her. Strike up the band! Pick a handful of boutiques and one or two shopping districts, or you’ll end up overwhelmed before the get-go. For instance, I focus on the Spanish marque, Zara, which slashes prices like almost no other store (I once scored almost 400 euros-worth for under 50 euros!). You’ll find clusters in busy shopping districts throughout the city. Boulevard Haussmann, for instance, has five Zara’s in a six-block radius. Two are inside Printemps and Galeries Lafayette, and one even has a view of the Opéra! Divine, yes, but their proximity also saves you time. The Zara location in the Félix Potin building on rue de Rennes is a personal favorite because it usually serves as one of last stops for the chain’s closeout clothing sales. Also, the fair sight of the stunning Art Nouveau dome topping off the bargains inside is heaven. So gaze up, but do look both ways before crossing! 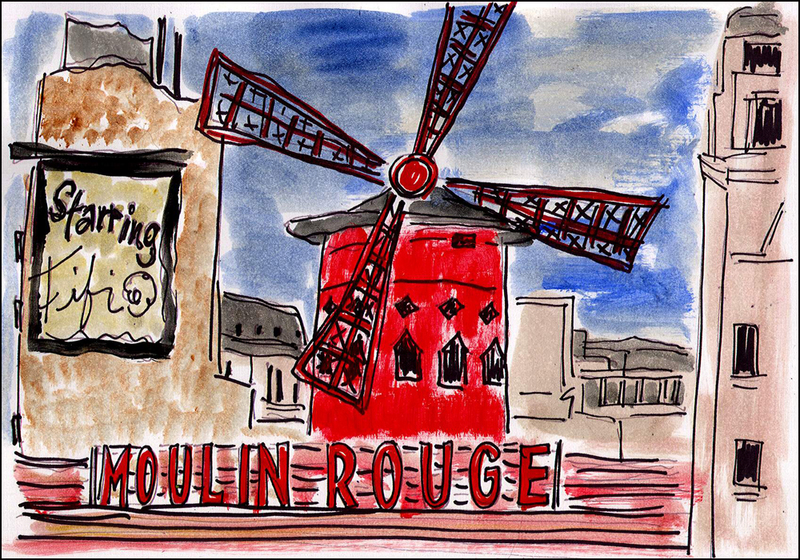 Now, let’s take a breather at the Moulin Rouge! 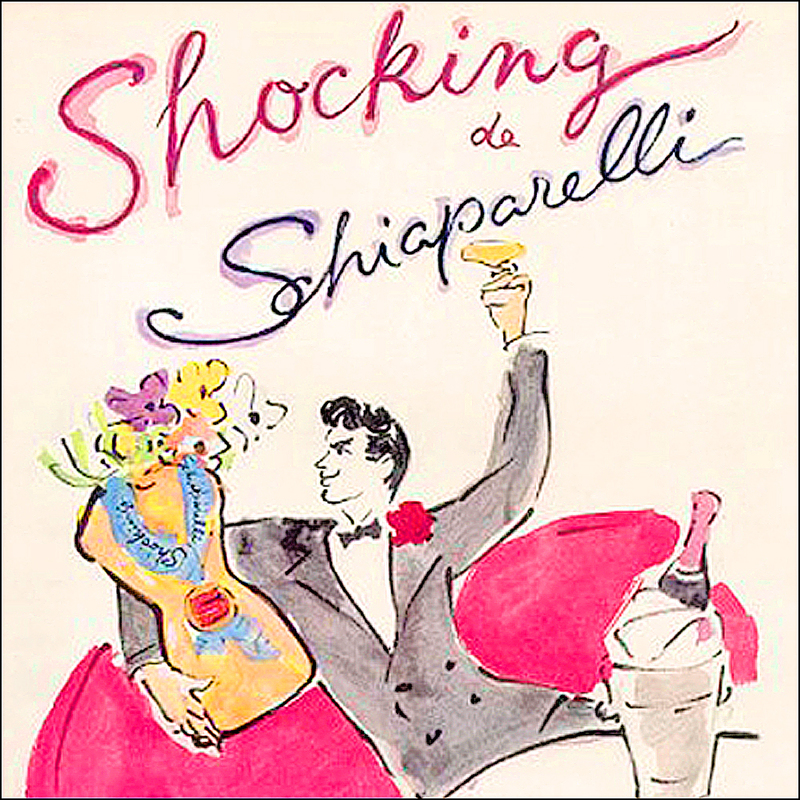 For kicks, I’ve meshed Fifi’s works with some fine vintage art created by Marcel Vertès for designer Elsa Schiaparelli. Love IS in the air. Ring-a-Ding-Ding………..I am dashing off to fetch Virginia and the magic bicycle……..we shall certainly need it on this trip! Theadora, please arrange a luncheon with Fifi, she does sound such a delight……..my and her leading man sharing the Tin Man’s first name…..oh the heart is a flutter!!! We just attended a party at the local Museum of Art for a Matisse opening…….you know Tinny has an original Matisse graphite lying about unframed……for the love, get that baby on the wall, I say! I have packed Chocolates from Argentina (for energy) they have a bit of hot pepper in them to put a punch in out step. I have picked up 4 carnets of tickets for I am sure we will be dashing hither there and yonder, with Virginia clutching her hat against the breeze. You can drop me at Sympa for hours, darling…………oh, and TATI…yes, yes, yes. For the love……VIRGINIA…..let’s get a move on. Ring-A-Ding-Ding!! Dear Monsieur Tin Man, I think I spotted Virginia’s magic bicycle by the Seine. The little basket was choc-full of goodies: bread, wine, and cheese. Bubbly, too! No sight of Virginia or her fabulous ruby-soled Christian Louboutin shoes. Perhaps she is still visiting with Matisse? She’s a time-trekker! You are so thoughtful. Thanks for packing the chocolates with the hot pepper. My favorite. I’ve got the water. While you shop the bins at Sympa, I’ll stop by Matisse’s studio in Paris on the quai Saint-Michel. You know the one. With the view of Notre Dame. He’ll help us find Virginia! I’ll keep you in the loop. I would love to meet for lunch in a cafe in Paris!!! 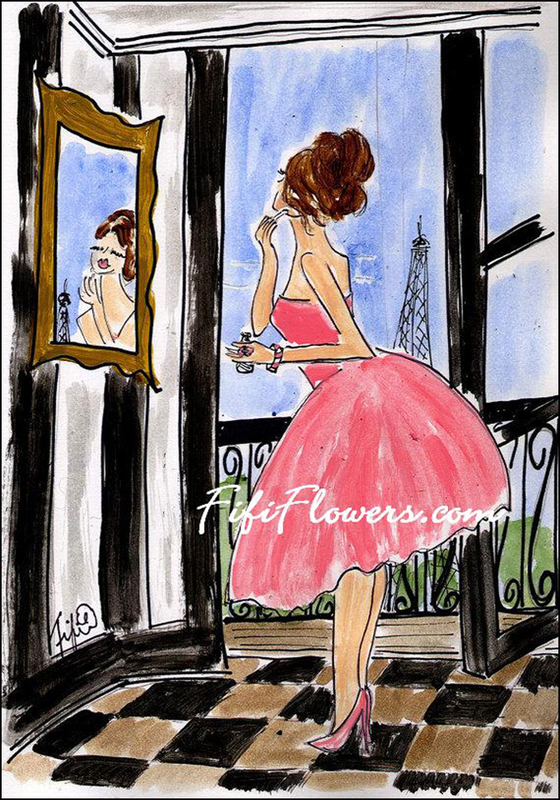 Oh darling Fifi……..your art is stunning! I have purchased a piece for Virginia. Don’t tell her, it’s a surprise. 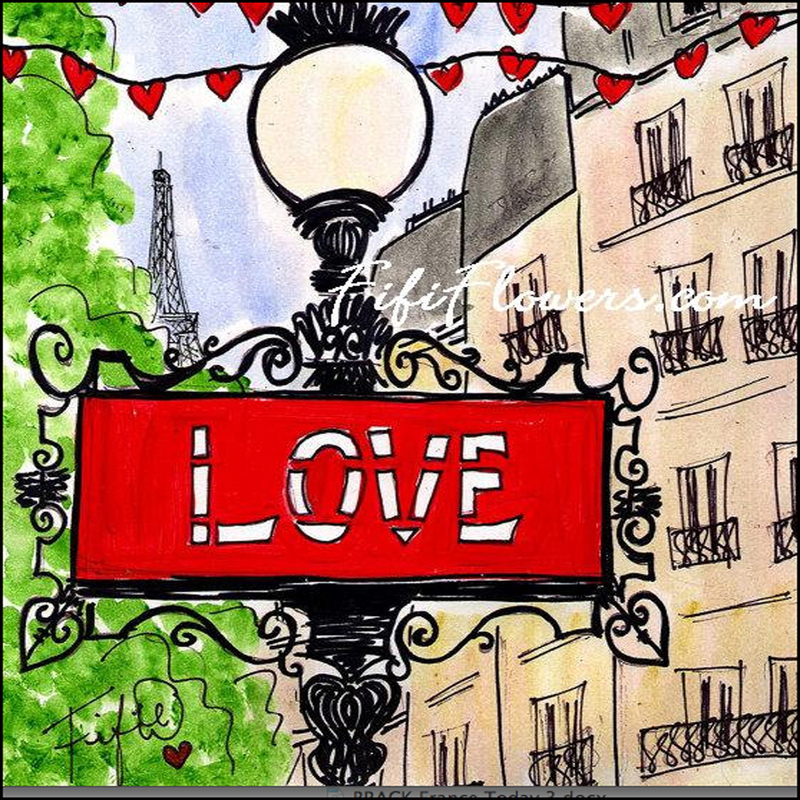 Oh to come wander the streets of Paris together………what a delight it would be. What a fabulous, fabulous surprise, Monsieur Tin Man! It’s our secret. Mum’s the word!! T.
such beautiful and fun pictures. I love it! 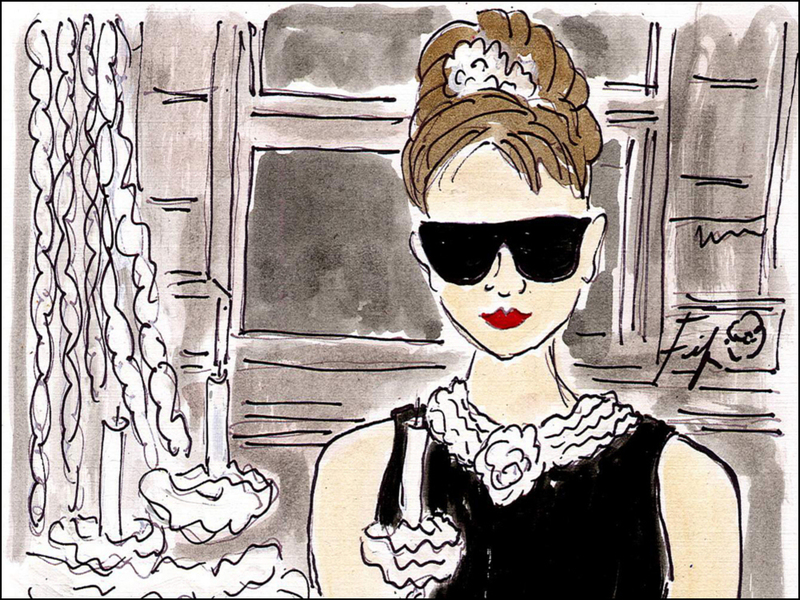 I’ve never been to Paris, but her work inspired a drawing for me last night. I’m going to add some watercolor soon. Ah, Fifi will be happy to hear this news! Do you plan to post it? If so, do send us a link. We’d love to see it. ~T. We’ll see how it turns out and how brave I’m feeling. I’m a beginner. Hi Theodora, I used my painting in this blog post today. Thank you for introducing me to Fifi! Wonderful News, Jenny! I’ll check it out today. Don’t stop! T.
Fantastic shopping info and gorgeous art from Fifi. Thanks for sharing! Ha! You had a fan club, Bradley. Imagine life with doodling. I carry a pad with me everywhere I go! T.
Ahhhh, my heart jumped for joy when I saw your post in my in-box! And of course, i wasn’t disappointed. 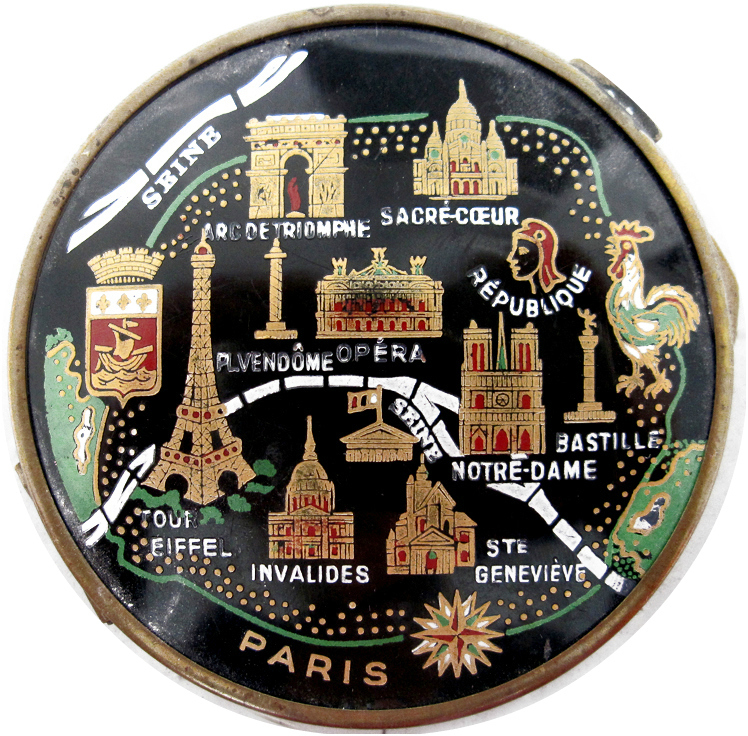 I wish I were going to be shopping in Paris, but I’ll settle for Dijon and Beaune. I love Fifi’s paintings (and Marcel’s as well.) They go perfectly with your inviting tips. Well, Merci, Janet! Say, I owe you some information on Dijon and Beaune. Forgive me! I’ll send something tomorrow. Have you purchased the “France” tour guide by Rick Steves? Back in December, I took hi “Rome” guidebook to yes, Rome. Great insider tips. And he’s witty, too! I highly recommend his books. Have you started to pack? I’m looking forward to your reports and photographs, of course. I’ll look forward to your info. The “France” book has come in handy, although it only has Beaune, not Dijon. I haven’t really started to pack, but will be doing that in the next few days. I’m getting the important things done, though–getting to and from the airport, have tickets and car rental, called cc company and bank, put mail on hold, etc. 🙂 I’m looking forward to it myself, although I’ll miss Provence a bit. Of course, you’ll have to visit the Maille mustard shop (open since 1747). A must-see! 🙂 I’ll shoot you an email over the weekend! T.
Here they’re loyalty cards, and you take them for granted, but fidelity cards sound much more emotionally bonding. 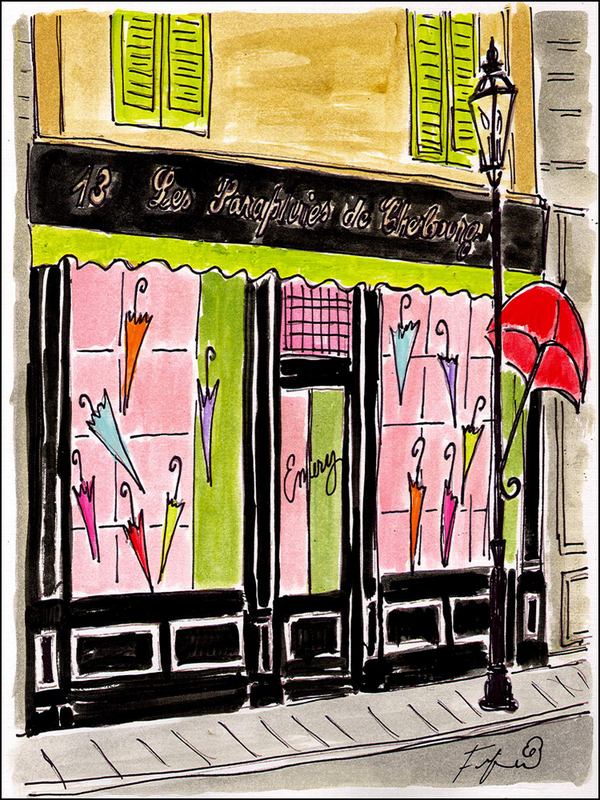 I am sure I will never be able to shop in Paris, but it has been fun to dream of it with your wise tips! And I am inspired to go shopping somewhere even if it is only here in Texas. Fifi’s art is delightful! Texas! Do you have a favorite shop in Texas? I think Zara has a few boutiques in the Lone Star State. And YES. I agree! Fifi’s works are delightful. The moment I spotted, I tumbled flat. I love the energy. Each time I see them, I smile. I was pleased as punch when she agreed to share them. What a gift! T.
Thanks for Fifi’s art. I will revisit the tips when I get the chance to live in Paris for half a year. Thanks so much for introducing us to Fifi — love her work! Merci! It was very difficult narrowing down the selection, and figuring the sequence. She has hundreds of works in her shop, gallery, and online portfolio. I spent weeks on the post, studying each image. And of course, she was a delight to work with throughout the month. Very patient! You should check out her shop. Prices are affordable! T.
Bravo! I like your brilliant post and thanks for sharing. Bye. K.
Thank you, Kamila! I’ll share your sweet words with Fifi! ~T. HA!! Thanks for the giggle, Kim!! By the way, thanks to your recent post about the Le Train Bleu, I’m now working on a post about the Le Train Bleu ballet. Thanks for the inspiration! And of course, I’ll include a link to your post. The meal sounded incredible! T.
Le Train Bleu ballet??? That sounds intriguing indeed! The meal was as delicious as the appetizing setting – can’t wait to read your forthcoming post. YES. YES. Gorgeous, indeed! T.
Pink, pink, and more pink! La vie en rose indeed. Let There Be Pink, I say. Thanks for showing us just how it’s done, Fifi and Miss T! Dear Martino! OH, dear. Good. Golly. Now I’m humming the “Think Pink” song from Stanley Donen’s Funny Face movie (1957), starring Audrey Hepburn, Fred Astaire, and Kay Thompson. Strike up the band!! Green is obscene, brown’s taboo. And there is not the slightest excuse for plum or puce —or chartreuse. But tell her if she’s got to think: Think pink—! Fabulous tips, Mrs. J.! I’m digging your list. Repetto is one of my favorite shops. I love studying their vitrines. And macarons. I am hooked, I confess! They’re also fun to photograph. It’s another win-grin! T.
Every one of Fifi’s pictures took me right back to Paris! What a discovery. Wish I was there for the sales, but did pick up an Audrey Hepburn top here in Italy – I won’t ever look like Audrey of course, but at least I have something that I could imagine her wearing! So many priceless tips and so beautifully written and illustrated! Thank you, thank you Theodora for another stellar post! How I adore the French for – among so many other things – sticking to the idea that sales should start on a defined date rather than dribbling in confusingly as they do here, so that some stores have finished whilst others have yet to begin! It reminds me too that our Parisian cousins do things so much better retail-wise at Christmas time with those little platforms to allow little folks to see into the displays. Well, I suppose the city did, if not invent, then definitely perfect the department store, has kept couture when les autres have lost it and created the concept store when practically every other big destination is becoming decidedly homogenized. Vive la vie au magasin… and a very happy ete to you. Ah, thank you for the visit! I agree. I agree. I’m already looking forward to the Christmas lights and vitrines. I usually try to attend their big launches. It’s always thrilling. Festive, too. I also appreciate the little platforms for the little ones. Very considerate! For the love of a close-up, sometimes I use them! Paris. Paris. And YES. The city still has its iconic darlings: The Grand Magasins. They’re gorgeous. Pinching from Zola: My cathedrals! I always encourage folks to visit. Another confession: I’ve never failed to look up the stained glass dome at Galeries Lafayette without weeping. It’s true.I get goosebumps. yes, the dome. It bring a lump to The Dandy’s throat. A friend worked there when I lived in Paris many years ago and became the source of many fragrant pleasures in sample form. Now, I’m not sure I’ve ever written about Elsa… surely something to be corrected, but Mae I’ve opined on many a time. I have been enjoying your spring clean! The magic bicycle bumped over the cobblestone streets. The paniers and the wicker basket filled to overflowing with pink champagne, mysterious packages, drop cloths and liters of Schiaparell’s pink paint. Inspired by FIFI FLOWERS Tinny and Virginia were decorating The third floor Paris apartment. What a day it had been. Shopping the sales. Lunch with Fifi and Theadora. A rest while Virginia shopped for a pair of Louboutin shoes (she so loved the red soles). They watched the dawn breaking over the roof tops as Tinny put down his paint brush, pounded a nail into the wall with his silver axe, and hung FIFI FLOWER’S PINK TIGHTS. And your third floor Paris flat is as gorgeous as your newly-acquired Christian Louboutin shoes. I also scored a pair, in sky blue with ruby red soles, of course. Lunch with Matisse, Fifi, and Monsieur Tinny was divine. What a day it had been, indeed! With a sunrise, to boot. 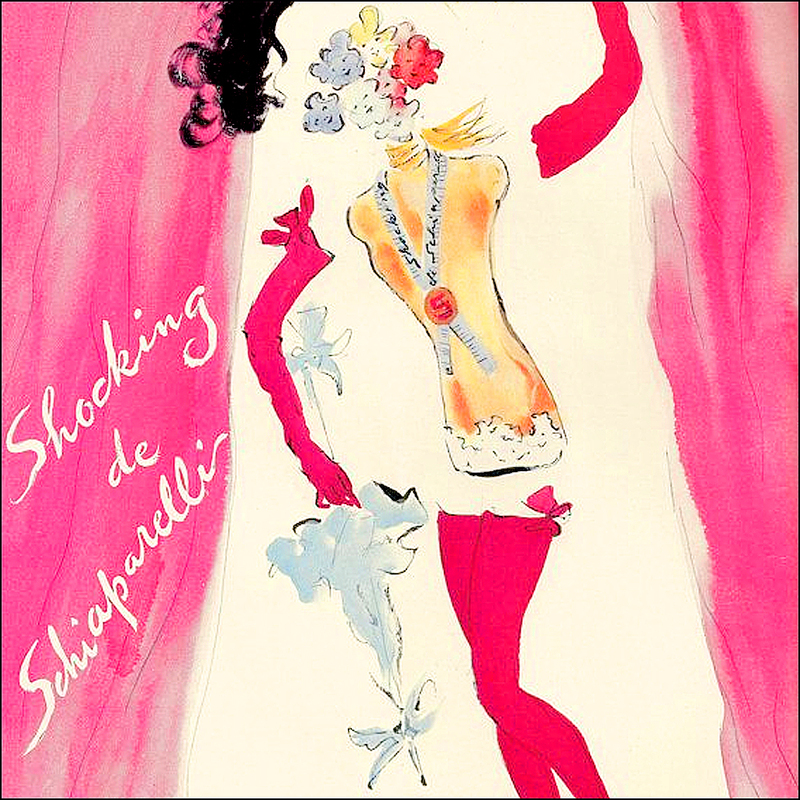 From head to toe, I’m covered in the Schiaparelli’s Shocking Pink paint, but I don’t care. Good. Glory. It’s now high time to go out and purchase some baked goods and coffee, while the paint dries. We’ll then help you gather the drop cloths. I’m tuckered but inspired. Ah, I’ve always enjoyed the dreaming phase of the trip! After your plane lands, what’s your first stop?! T.
Fabulous Plan! Have you seen Adele’s “Someone Like You” video? Shot in exquisite black and white by Jake Nava, both Adele and the Pont Alexandre III look (along with the River Seine!) glamorous. In the video, you’ll spot the Eiffel Tower, the Grand Palais, Les Invalides and the Place de la Concorde. If you squint! T.
Merci, Shelley! And apologies. I’ve been working in the “field” again. I think missed the second part of your France series. Heck, I know I did. \I’ll catch-up over the weekend. So you managed a little shopping? What treasures did you find? Did you spot anything at Shakespeare & Co.? And speaking of wonderful, I also thoroughly enjoyed your nod to Monet’s Garden. Dreamy place. Your photographs are beauties! T.
Thanks T – Monet’s garden was certainly dreamy! I surely did a little shopping – , I was very taken with “And Other Stories” in Paris, the upmarket H&M – have you looked? I wanted to do Clignancourt and some second hand clothing stores as you suggested . I am in the middle of writing a new post about the things on my bucket list I missed and this was one of them. My bucket list was based on many of your suggestions and those of Bryan Pirolli – you both do such useful and interesting posts! But as my impending post will say “Je ne regrette rien” – we did so much in an action packed four days and now I have an excuse to return in 2016! Confession: I’m a fan of H&M. There. I said it! Did you find any treasures? And speaking of your France trip, you covered a lot of ground! Je ne regrette rien, indeed! I’m looking forward to your bucket list post. Have I missed it? Keep me posted! We’ll include a link here. And I agree. Bryan Pirolli is pretty darn fabulous. And witty, too. I did find the most gorgeous grey leopard longline cardigan in H&M- very cheap! Have you looked at COS which is another of their upmarket stores – lovely! Still working on the post…. coming soon. Merci, Mélanie! Fifi will love your sweet words. 😉 Enjoy the weekend! T.
Brilliant! Shopping without focus is hellish. 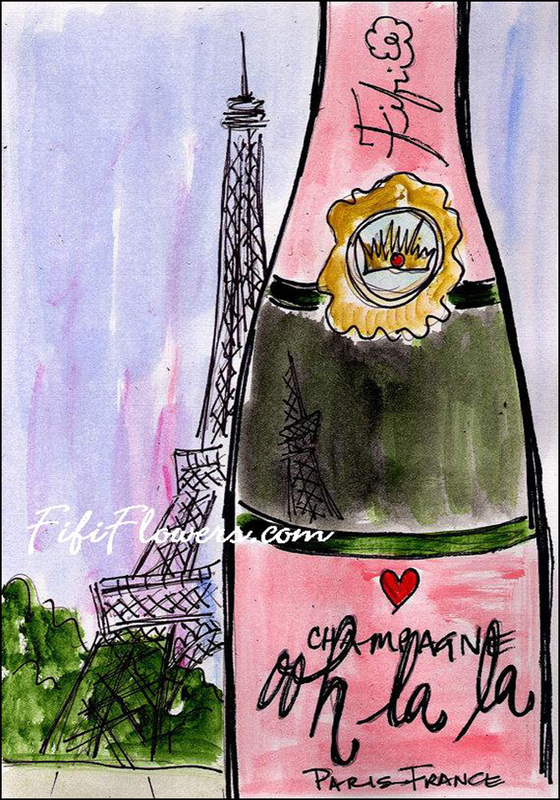 Love Fifi’s paintings too – she’s really captured the spirit of the city. Oh my daze, you and the gorgeous Fifi were made for each other! Ah, thanks Patti! And just like Richard, you capture your city like no other. New York City shines, always. Sparkles, too. ~T. What a fun post!! I’m wishing I were there following all your tips. (maybe next summer for our both anniversary when I’m hope, hoping to make it to Paris to celebrate!) Happy shopping! Beyond the approaching Tour de France, I rarely spend time considering Paris. However, Fifi’s fun drawings and your zest are quite appealing to a guy that rarely gets out of denim and flannel. Very nice. A great column. It is full of tips and “inside” info… I am sharing with many of my friends. While I am not into shopping you almost have me wanting to take that bus ride. I adore your selection of Illustrations. As always, thank you, Thom! Fifi will adore your words. I know it! There are quite a few scenic bus lines in Paris. The “80” bus line is another favorite. Along the way, you’ll spy the Champ de Mars, the Eiffel Tower, and Le Mur pour la Paix created in 2000 by artist Clara Halter and architect Jean-Michel Wilmote. Here, the word “peace” is inscribed in 49 languages. Seeing it moves me every time! It connects two of my favorite shopping hoods: Rue des Abbesses and Rue Commerce. Does your wife still have her Zara coat? I love that story. Enjoy the week! And thank you for spreading the word about the post. I really appreciate it! I am so sorry for this very late response to the publication of your latest and totally thrilling post! 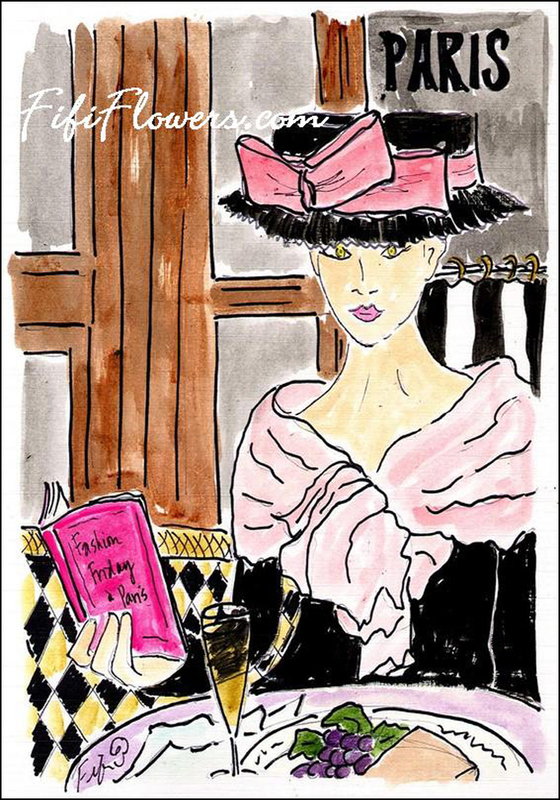 I had been in the midsummer doldrums until I bought some vintage Champagne coupes and your latest post arrived in my inbox! What a perfect combination! reading your great column and seeing Fifi Flowers artwork! How stunning are you two together?! Holding a coupe full of fizz and doing a virtual tour of the Parisian sales is enough to make any girl giddy and I just loved it! Thank you Theadora for making life just so much more exciting!. Perfect timing, Karen! And you arrived with Champagne and thoughtful words. I’m now feeling giddy. Your positive energy is contagious, always. I’m happy when you stop by for a visit, always. Thanks for lifting our spirits! Have a creative and productive week! What a fun post! It’s always such a pleasure to come here for a breath a fresh air. Fortunately, I’ve not been bitten by the shopping bug and so I’ll live out these sales the same way I do non-sales periods: in a park with my writing journal! 😉 That said, I did post a “sales” collage over at Paris by Cell Phone, though my photo is by no means as light and fanciful as the drawings here or the text that accompanies them! I just spotted your nod to the Big Summer Sales. Gorgeous gallery, Paul! Good. Golly. What street did you capture with your lens? Fun shots! For the love of window-shopping, I’ll add a link the post. And thanks for your kind words. I’ll pass them on to Fifi! I can’t believe I am going to bother you with this, but I so thoroughly enjoy your blog that I have to ask; are you having trouble posting images where you want to post them on your blog. WordPress has changed the formatting again and have just made it harder to blog. I just gotta know and as always, much love from Baltimore. I’m late! I know! Are you now able to post photographs? Yeah, it’s weird. Now, it seems, that you have to add the photos that you want to use in a ‘Gallery”. Before, I could just upload any photo that I had saved on my computer. Hell, I could just do an image search while writing the blog and insert it into the post. 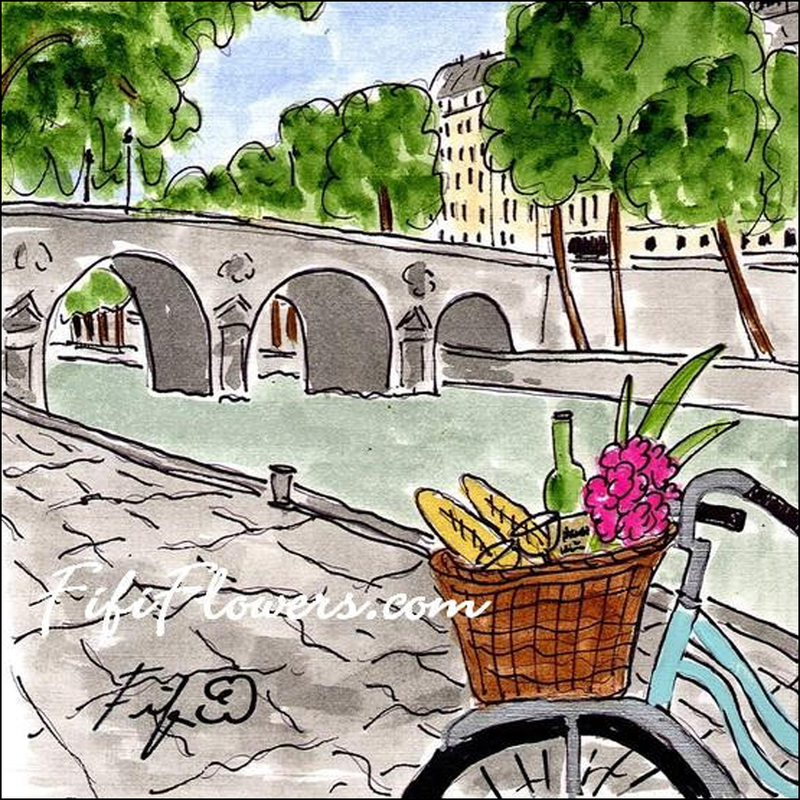 Wonderful shopping tips Theadora, what a great list for anyone visiting your beautiful city. Love reading your writing. 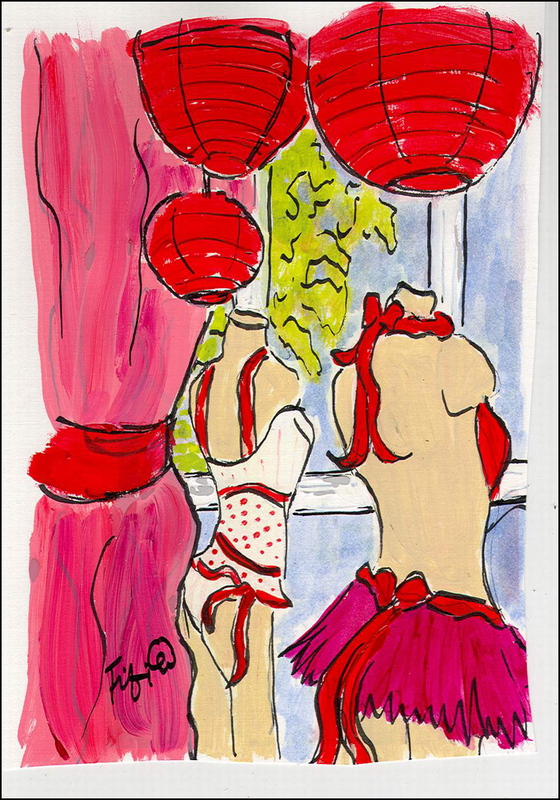 Beautiful showcase of Fifi’s artwork perfect for the theme to your post – ooh la, la!. I was away during May and have only recently realized that many blogs that I’ve been following are not loading into my Reader, so I’ve un-followed and re-followed your blog. Not to worry Theadora, blogging takes a bit of time and we have a lot on our plates. You bring magic to all of us with your wonderful suggestions and uniqueness in introducing us to everything Parisian. Good question, I finished the ballerina, if you look under Thursdays Drawing – Category, you’ll find her. I’m not totally satisfied at how she turned out – the frisket really gave me problems for her legs and feet, but I enjoyed the process of drawing her. I have started a new drawing, called “Waiting” a seascape which I’m loving the project. I’ve never drawn waves before, so this is an exciting drawing to work on – I can feel those waves coming on shore. I’ll be posting an update this Thursday. Thank you dear Theadora for your lovely comments – I hope you have a beautiful week. I knew I shouldn’t read this. Now I want to nip over to Paris to expereince all you are talking about. Tip one is a goodie for me – know what you want. So simple but thereby hangs the success of the day. Oh, yes. Lists are a beautiful thing. Thank you for this post. I so love Fifi’s artwork. I have three pieces, and oddly enough, just today I was thinking of purchasing more! Perfect timing! 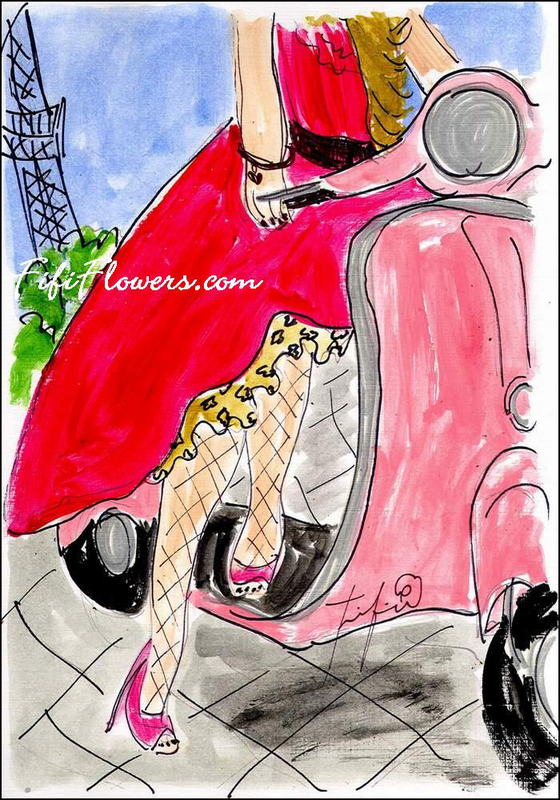 I save your shopping and sightseeing tips for the day when I may visit Paris again. Merci beacoup! Great tips…I will be in paris next weekend, hope there us something left for moi! Thanks for spreading the word! I really appreciate it! Great post! I always return to Paris for the twice-a-year soldes – much more and better shopping options than here in Brussels. My secret is to focus on independent designers who produce small but quality items as the savings for these can be significant. Some of my favourite shopping haunts are in the north of le Marais. As much as I dread going to the grand magasins like Printemps & Galeries Lafayette (regardless of whether the sale is on or not), these are good options for shoppers who are pressed for time as they have a wide selection to choose from,. Plus you could almost get anything and everything you might need/want – e.g. shoes, lingerie and even lingerie – at massive discounts! Simonne & Lisa B. (http://www.simonneetlisab.com), which is near Marché des Enfants Rouges, is a favourite with its selection of designs by independent designers. As for brands, I like Surface to Air and Ambrym (www.ambrym.fr) for their cuts. Very nice illustrations. Love it. I agree! 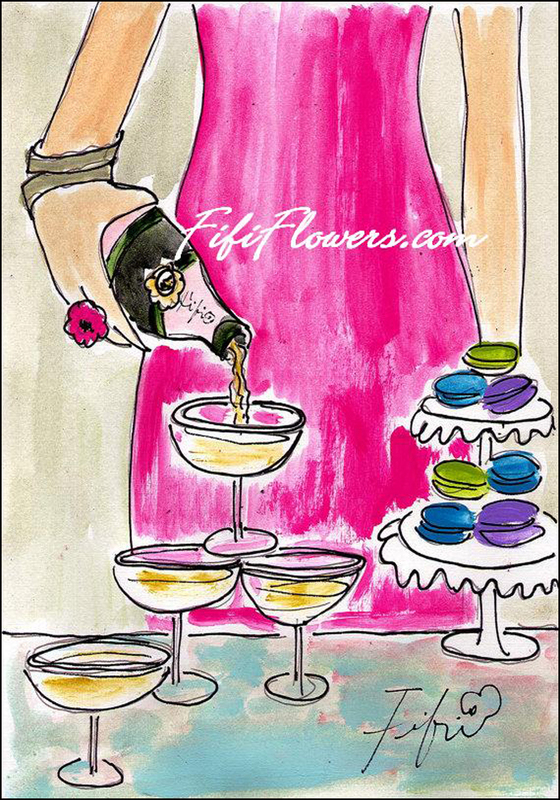 I’m also a big time fan of Fifi’s illustrations. Her art always makes me smile.